We reported yesterday about the issues the Xperia Z3+ might face if Sony doesn't do something about the overheating issues of Qualcomm's Snapdragon 810 chipset. A video showing a prototype unit with pre-release software proved that Xperia Z3+ powered by the Snapdragon 810 has major issues when running multiple apps. The smartphone issues warning messages from time to time telling users that some apps might have been closed in order to cool down the CPU. Keep in mind that Sony Xperia Z3+ is equipped with a revised Snapdragon 810 v2.1 chipset, which was supposed to address all the overheating issues that date since the launch of the silicone piece. Even Japanese carriers posted warning messages inside their stores informing customers about all the smartphones equipped with Qualcomm Snapdragon 810 processors, which inexplicably overheats regardless of what users do with their device. Well, it looks like there are serious problems with the Xperia Z4 as well, which is likely to be equipped with the same revised version of Snapdragon 810 chipset. As many of you probably know by now, Sony launched the Xperia Z4 in Japan on June 10. 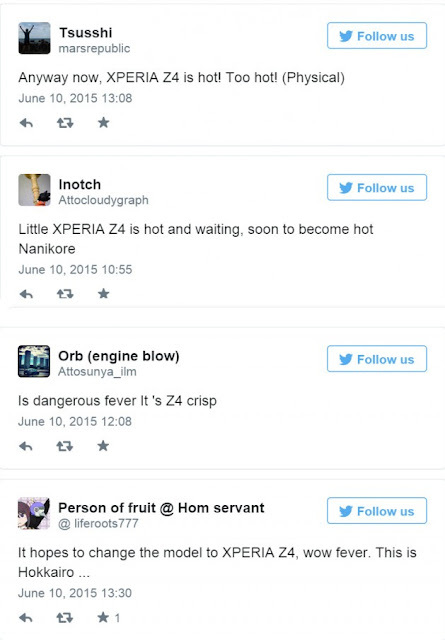 Sadly, many customers that purchased the phone are now complaining of overheating issues, XperiaBlog reports. They have taken it to Twitter, Sony support website and other forums to find out why is that happening and how they can prevent their phones from becoming too hot to be used. This doesn't seem an isolated issue where only a limited number of users is affected. However, we expect Sony to release a software update for the Xperia Z4, which should throttle down the Snapdragon 810's speed. In fact this has become mandatory since Xperia Z3+'s global release is just a few weeks away and no will buy it under these circumstances.